The third quarter was a tough period for this digital-imagery specialist, and the next quarter isn't shaping up to be much brighter. Shutterstock (NYSE:SSTK) shares fell 20.2% in November 2016, according to data from S&P Global Market Intelligence. A mixed earnings report with soft guidance goals dragged the stock down, erasing a full quarter's worth of share-price gains. In the third quarter, Shutterstock beat Wall Street's earnings targets but fell short of analysts' revenue estimates. The provider of digital image services for both consumers and businesses delivered 40% year-over-year earnings growth on a 15% sales boost, but paid download sales increased by just 8%. Looking ahead, management expects fourth-quarter sales of roughly $407 million and adjusted operating profit growth in the 15% range. These targets have stayed in place for the last three quarters, which is not encouraging for a company in the high-growth investment category. 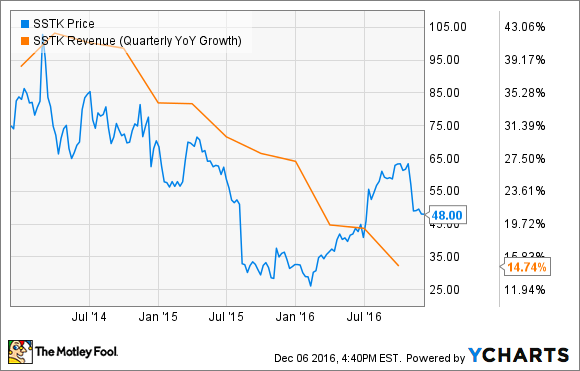 Shutterstock's trailing sales have doubled over the last three years, but the growth rate is slowing down drastically. In the fall of 2014, trailing revenues were growing at a 40% annual clip; today, the pace has slipped all the way down to 15%. Share prices don't follow the revenue trend with robotic precision, but sales-growth results do tend to set the tone for Shutterstock's stock chart. Setting a low bar for the important holiday quarter will not inspire investors. The post-election surge in the U.S. dollar's value against other world currencies is another headwind for Shutterstock, which collects some 66% of its revenues from international markets. If I were a Shutterstock investor, I would not hold my breath waiting for a quick rebound.